This book sets out to describe the personal experiences of a state worker in Missouri as she attempted to implement educational reform programmes in the late 1980's. This was a critical time in America as other states were mandating new regulations to improve the quality of schools. Problems emerged such as lack of resources, bureaucratic red tape, and a dysfunctional administrative structure caused chaos, hampering the ability of the state workers to regulate and administer the new programmes. Some of the superintendents who did not believe in the new programmes resisted by abusing state funds and witholding information so teachers could not participate. This is a timely case study as legislators play a more important role in developing schools and the state will become the responsible agency to implement reform. 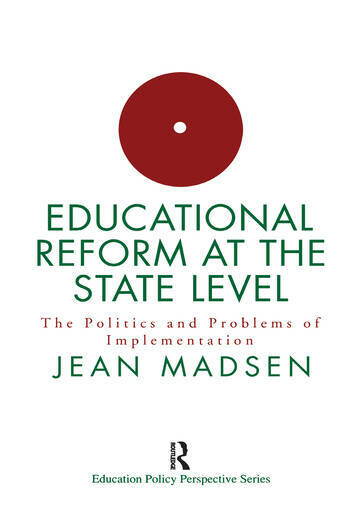 Madsen's experience verifies the policy implementation literature and cites several new theoretical perspectives on the important role of the state agency in determining the success or failure of mandated reform programmes. The study indicates the need for state agencies to change their perspectives from regulation to service orientation if reform programmes are to succeed in schools.